1 year ago, my cousin Souvik and his wife Aarti came to visit us in Vancouver Canada. 6 months ago, my husband David and I decided we needed to experience a unique travel adventure with our kids and booked our flights to Indonesia. Planning began; travel advice and recommendations whirled around via email. The Busy Life of Leisure Lady in residence, Aarti, was an invaluable resource of the what, where, when and why’s of experiencing Indonesia. She mentioned a town called Yogyakarta, the home of one of the largest Buddhist temples in the world called Borobudur. I was drawn in by the name. Hey, this place must be a yoga haven! “Pia” says Aarti, “it’s pronounced Joag-Jakarta.” Y = J. Ok. Got it. A few days after arriving in Jakarta, Aarti and I escaped on our own mini-adventure, with no husbands, kids or sister-in-law, to experience what Jogja had to offer. Jogja had plenty to offer where my body, mind and soul were concerned. It was an absolutely beautiful, serene, wonderful, quiet retreat in a small village past the main town center, across from a rice field. Our room felt like a honeymoon suite!! 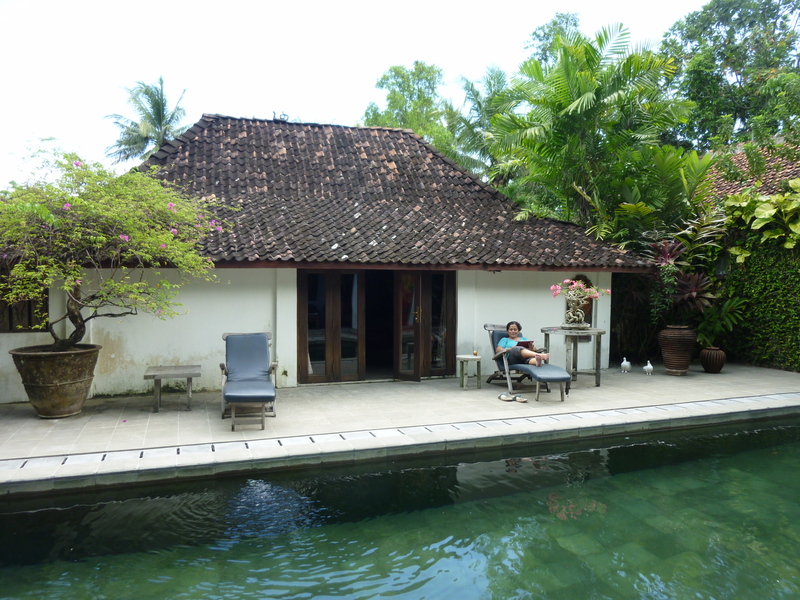 The architecture was typical Javanese, and the surroundings held a balance of serenity and nature. No stress here. 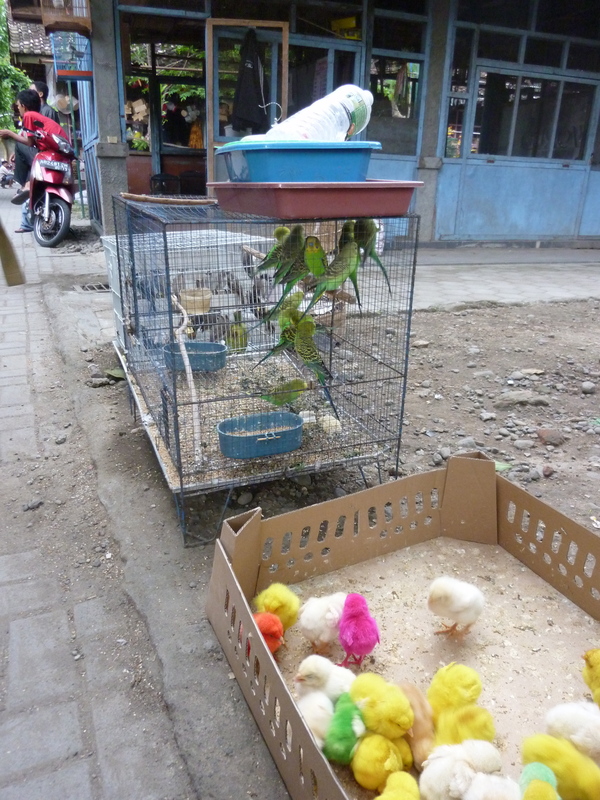 We decided to take a drive around the city, check out some of the sights, including an interesting bird market. Pink and green chicks? Happy Easter…. Then in the morning we woke up before the light and drove out to Borobudur to experience the temple at sunrise. Rolling with the flow of ups and downs ( forgotten wake-up calls, and an unfortunate accident with a stray cat on the road – sorry Kitty! ), we made it to the temple by 5 am. Arriving at sunrise in Borobudur was absolutely one of the highlights of my trip to Indonesia. We were at the top of this 9th century temple even before the roosters started. The surrounding area is rural and peaceful…Seemingly far from any chaos. Very few tourists enhanced the experience of the awe-inspiring views of the volcano Merapi in the distance. I was fascinated by the number of Buddha statues (over 400) and panel carvings depicting scenes from the life of Prince Siddharta. 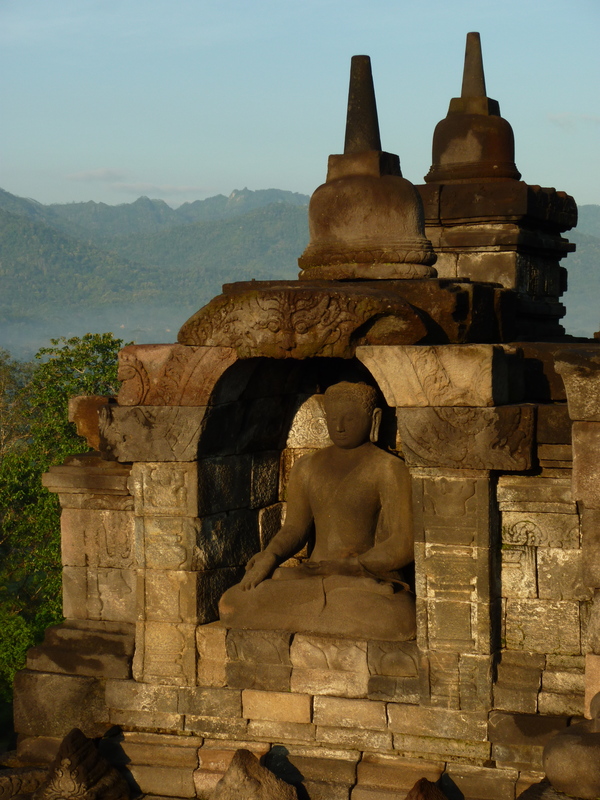 The site was abandoned in the 14th century after Hinduism was on the decline in Java, and Islam was on the rise. It wasn’t until the early 1900’s that someone happened to find it buried under the jungle overgrowth and volcanic ash. It is a very special place, and a memory I will keep with me for a very long time. Gorgeous views at every turn. Returning back to Yogya, we had a wonderful lunch with papaya/lime juice and homous appetizers at a typical young tourist café, where young people were eagerly chatting and sharing their travel stories. I watched them enviously, I must admit. To be a young, single traveller again with no responsibilities…impossible at this stage in my life, but fun to dream about. We continued on to the Prambanam Hindu temple. It is dedicated to the Trimurti – the three aspects of God – Brahma (the Creator), Vishnu (the Preserver) and Shiva (the Destroyer). 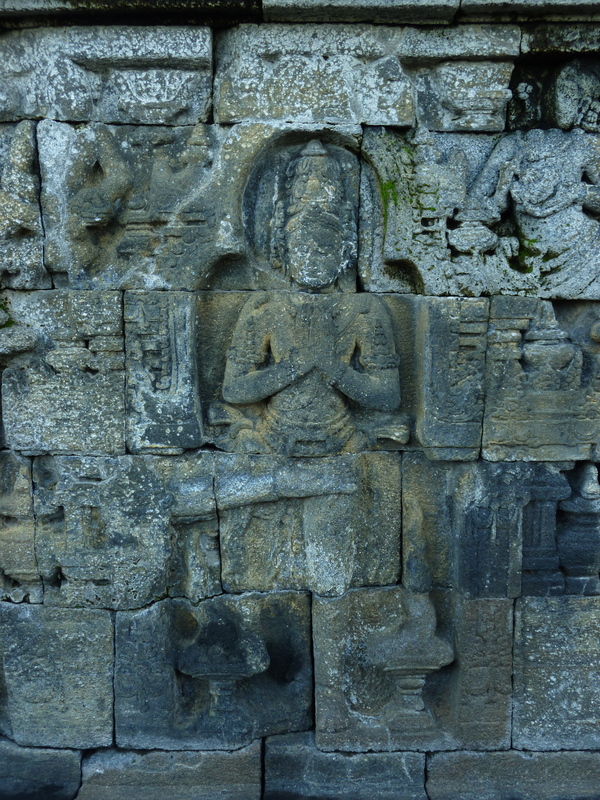 The structures, surroundings, and deities were very different from Borobudur. However, despite many travels to India, I have never experienced a Hindu temple before. I was thankful to have had the opportunity finally in Yogya. With no offense intended, after experiencing Borobudur first on our itinerary, Prambanam felt like a 3 star hotel after a spectacular, glistening 5 star resort. Definitely worth seeing, but it did not have the same impact on my Spirit. That was the end our getaway and we set off for the airport to continue our separate journeys. I am grateful to Aarti, my personal tour guide and friend, for taking the time to spend with me on this trip. 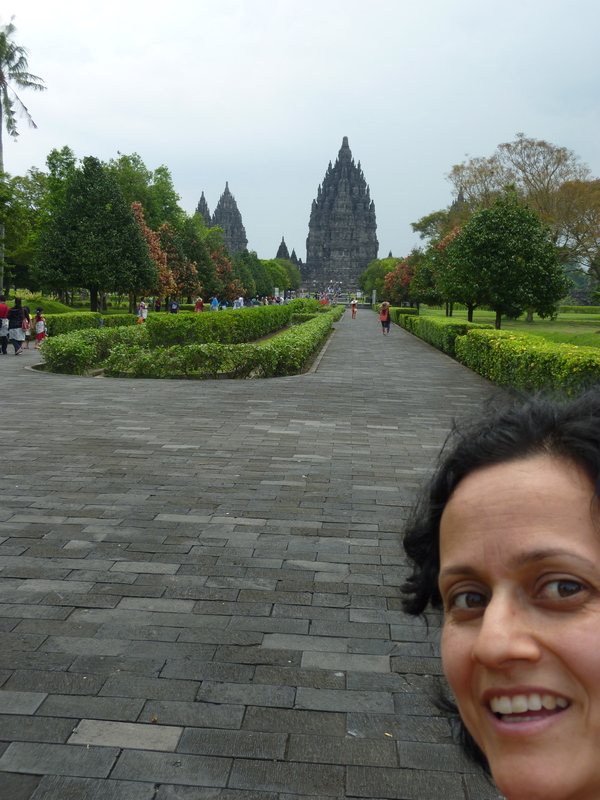 Yogyakarta left an impression on me in many ways – how much I value my independence, my Spirit and moments of stillness. Wow it sounds amazing, sad I missed that one… next time! Beautifully written & captured too. Thank you Sanju Auntie. I hope you are having a great time with all the kids -big and small!